Is Now the Time to Convert to a Roth IRA? Sheltering your savings from taxes is a powerful incentive for us to save within a tax-deferred retirement account. There are many different strategies to minimizing your tax bill. Having options provides us with many choices, however too many choices can often be overwhelming and confusing. In the name of simplicity, I’ll avoid what is sometimes called the “alphabet soup” of retirement accounts. Instead, let’s spend a moment reviewing one advantageous item in the still-cumbersome tax code: a Roth Conversion. First, a brief explanation of the key differences between a traditional individual retirement account (traditional IRA) and a Roth IRA. A traditional IRA allows an individual who is eligible to make tax-deductible contributions. Contributions to a Roth IRA are NOT tax deductible, but like a traditional IRA, all earnings and growth are tax-deferred. Another major difference: Withdrawals from a traditional IRA are taxed as ordinary income, while withdrawals from a Roth IRA are exempt from federal income tax (as long as you've reached age 59 ½ and you've met the 5-year holding-period requirement). Plus, Roth IRAs are not subject to a required minimum distribution (RMD's) at age 70 ½ like traditional IRAs are. Let me emphasize - this is simply a high-level review. Many additional rules govern the nuances of these accounts, including income limits on contributions and possible penalties for early withdrawals. Please email me or give me a call if you have specific questions and would like to discuss in more detail. The prospect of taking tax-free withdrawals is quite enticing. It’s probably the biggest advantage of a Roth IRA. You aren't shutout if you don't qualify for a Roth IRA, or if you originally opened a traditional IRA, as the IRS allows everyone to convert their traditional IRA into a Roth IRA. But is this a good idea? Well, for many, it is something that you need to carefully consider. The concept of a Roth Conversion is simple. If you decide to convert $150,000 of your traditional IRA, that $150,000 is added to your income and you’ll pay taxes on the total at your marginal tax rate. For example, if your income is $100,000 and you convert a $150,000 traditional IRA into a Roth IRA, add the two together and you’ll pay income taxes on $250,000. Note: The decision to convert is not all-or-none, you can convert a portion of your IRA each year and spread out the taxable gains. Following passage of the Tax Cut and Jobs Act, lower tax rates take effect this year which will now likely lower the tax bite for those who convert to a Roth IRA. Put another way, converting to a Roth IRA just became a little more attractive for many folks. Further, prospects that the federal deficit will rise in the coming years may bring higher tax rates – higher tax rates that could hit you when you begin withdrawing funds from your IRA. The possibility of higher rates isn’t a given, but it adds to the lure of a Roth IRA now. 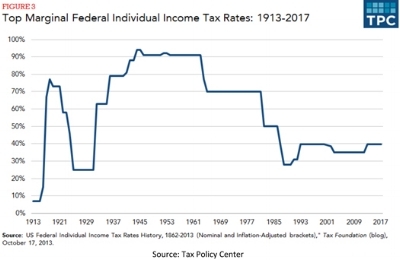 Take a look at the following chart of the top marginal income tax rates since 1913 (2018 top marginal rate is now 37%), and how historically they have often been higher. In other words, your income could be less when you retire, and it's possible that you could be in a higher marginal tax bracket in the future. Once a conversion occurs, you are the proud owner of a Roth IRA. Gains and income are sheltered, and withdrawals at retirement are exempt from federal income tax. What prevents folks from taking advantage of the benefits of converting to a Roth? The most obvious reason–the up-front tax bite. If you convert, it’s best to avoid paying the taxes from the IRA, because you’ll reduce the capital that’s sheltered from taxes. And, if you're younger than 59½, you’ll be facing the 10% early withdrawal penalty for the amount taken out of the IRA and used to satisfy the tax burden. Instead, you would want to pay Uncle Sam with money held outside your IRA. You can also take smaller bites. You may decide to convert a traditional IRA over several years, spreading out the cost. Or, convert just enough to avoid going into a higher tax bracket. While the up-front tax bite is probably the biggest deterrent for many, there is another reason you may want to avoid a conversion. Do you have government-subsidized benefits, such as health insurance, which might disappear if a Roth conversion raises your income? There are other potential consequences to consider when increasing your taxable income. It’s important to consult with a tax advisor in-advance before converting. To convert or Not to Convert? • Do you think you’ll need to take minimum distributions when you reach 70½? • Will you move to a high-tax state or a low-tax state? You may not have definitive answers to these questions. But they can be used as a guide. As I have repeatedly stressed in my newsletters, you are not in this alone. If a Roth conversion is a path you may want to consider, let’s talk. Together, we can explore whether a conversion is right for you. Lastly, don't forget that you have until April 17th this year to make your annual IRA or Roth IRA contributions for 2017.